1-4 Attendees – $1,095.00 (USD) Registration is for 1 attendee, addtional guests/attendess can be added during the registration process. 5+ Attendees - Save $60 per attendee – $1035.00 (USD) Early Bird discount for 5+ only available for attendees from same company. 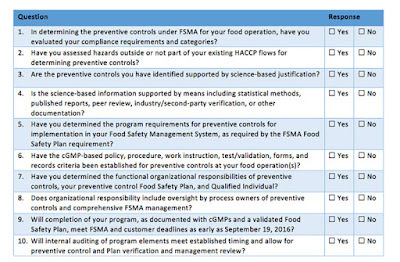 Table I. Kestrel Management’s self-diagnostic tool can help a company assess its level of preparedness for FSMA compliance. Compliance to FSMA has presented a new and difficult challenge for industry, the public and the FDA since it passed on January 4, 2011. With compliance dates for the initial FSMA rule—Preventive Controls—coming in September 2016, food sites must establish plans now to meet the impending deadline. Complying with the Preventive Controls Rule The Preventive Controls Rule was published September 17, 2015, with the compliance date for registered companies (more than 500 employees) scheduled for September 19, 2016. The compliance date is one year later for companies with fewer than 500 employees, unless otherwise specified under FSMA. 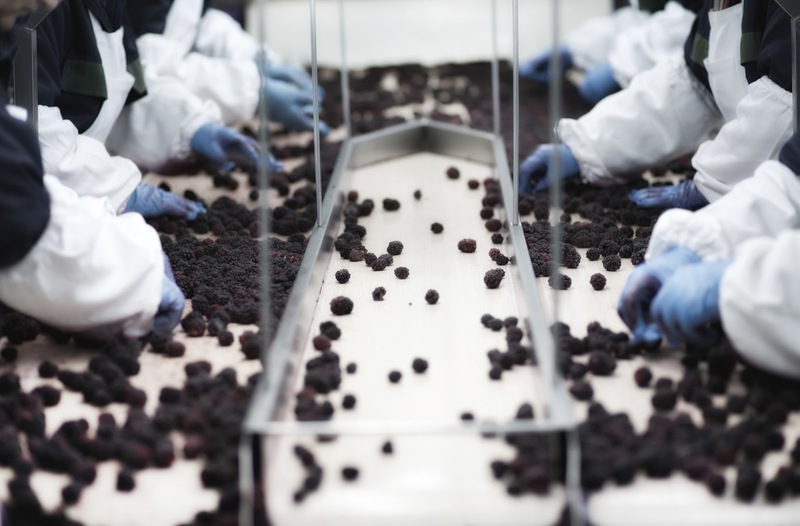 Under the FSMA rules, registered food facilities must evaluate and implement preventive control provisions and meet the requirements and the approaching deadline. The most urgent concerns for companies subject to the Preventive Controls Rule include developing a Preventive Controls Program, identifying a Preventive Control Qualified Individual (PCQI), and implementing a Food Safety Plan. Hazard Analysis. Companies must identify and evaluate known and reasonably foreseeable hazards. Preventive Controls. Preventive controls must be implemented to significantly minimize or prevent the occurrence of hazards. Monitoring. Preventive controls must be monitored for effectiveness. Corrective Actions. Procedures for addressing failures of preventive controls and prevention of affected food from entering commerce are required. Verification. Facilities are required to verify that preventive controls, monitoring and corrective actions are adequate. Recordkeeping. Records must be kept for two years. Written Plan and Documentation. A written plan must document and describe procedures used to comply with requirements. Qualified Individual. A Qualified Individual who has been adequately trained must be present at the facility to manage the preventive controls for the site and the products processed and distributed at/from the site. 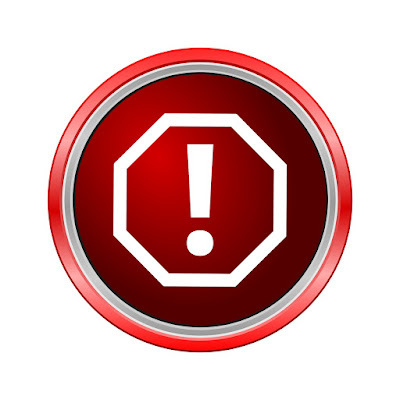 Failure to implement Preventive Controls (a.k.a., Hazard Analysis and Risk-based Preventive Controls (HARPC)) for qualified sites may result in fines and possible jail sentences. 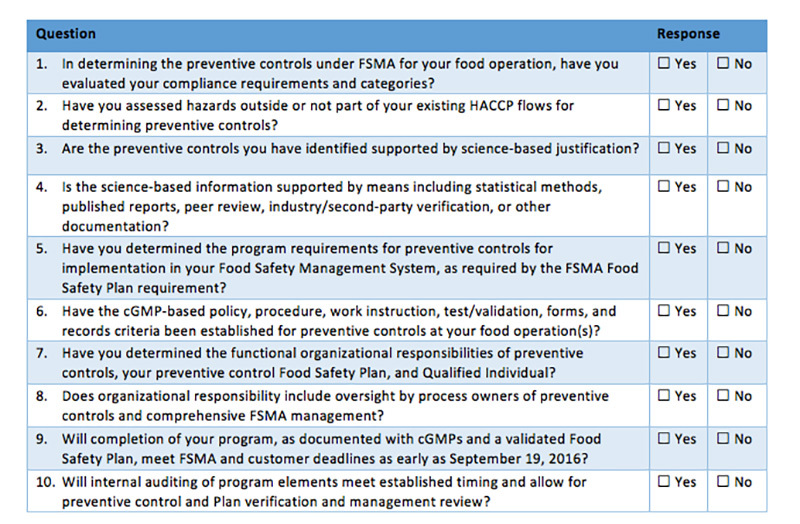 The following self-diagnostic assessment tool can help organizations better determine their current state of planning for FSMA compliance (see Table I). To complete your own planning assessment, review your progress compared to the questions below. Companies must have their training, planning and development underway to comply, or face possible violations, fines, and penalties under FDA enforcement. The questions in Table I will help companies identify the areas in which they need to focus attention. Kestrel can also help answer questions, provide input on solutions, discuss how to better manage the preventive controls program—and change “No” responses into “Yes” responses that promote best practices for FSMA compliance. The Global Food Safety Initiative (GFSI) is a global initiative for the continuous improvement of food safety management systems. From a functional standpoint, you might be surprised to learn that one of the most challenging elements of keeping up with GFSI compliance for many food producers is sufficient document control. In fact, data compiled by SQF shows that document control-related issues are one of the most common sources of a non-conformance during GFSI-benchmarked audits. Examples of these non-conformances are associated with documentation of training requirements, business continuity planning, and corrective and preventative actions. The Global Food Safety Initiative (GFSI) is an industry-driven initiative providing thought leadership and guidance on food safety management systems necessary for safety along the supply chain. This work is accomplished through collaboration between the world’s leading food safety experts from retail, manufacturing and food service companies, as well as international organizations, governments, academia and service providers to the global food industry. They meet together at technical working group and stakeholder meetings, conferences and regional events to share knowledge and promote a harmonized approach to managing food safety across the industry. GFSI is facilitated by The Consumer Goods Forum (CGF), a global, parity-based industry network, driven by its members. So what exactly are some of the most common causes for document control issues as it relates to non-conformances? Keep an eye out for the following five errors that can affect compliance. Lack of correct usage of document control in the context of GFSI compliance is a common error. This is an issue that often occurs as a result of document sprawl—specifically as it pertains to duplicate documents and supporting documents. For example, an organization might create internal reference material designed to be cheat sheets or summaries of larger policies. These could include simple charts that list key equipment set-up parameters or charts summarizing abbreviated information from product specification sheets. Many organizations fail to realize that because of the nature of the information in these files, these reference documents must also be included in their document control program to ensure that the information in them is current and universally applied. From using outdated forms to referencing outdated employee procedures, lack of proper document version control and enforcement is the most common GFSI compliance-related non-conformance. These issues can arise from operational errors (employees don’t know where to find up-to-date documentation or how to ensure that it is being used) to technical errors (the document control system is unable to properly manage document versioning, or in the case of home-grown document control software systems, they may be unable to do so altogether). To avoid these errors, it’s necessary to establish where controlled versions of documents are located and ensure that they are kept up to date. It’s also important remove obsolete versions of these documents—this is a basic principle of document control, but it’s often an area where errors compound over time. Reinforcing training so employees are made aware of document control best practices and policies is critical to keeping your compliance activities current. If your food safety management system includes or makes use of external documents, these must be controlled in the same manner in which you control internal documents. A best practice of document control is for the person knowledgeable about the content of a document to be assigned the responsibility of approving updates to it. In many organizations, this is interpreted to mean that all approval responsibilities are assigned to a single person across the organization. This could be the food safety coordinator or the document control administrator, despite the fact that it is not reasonable for a single person to be knowledgeable about all the procedures across the organization. A better approach to approval responsibilities is to identify individuals who can be responsible for authorizing changes based on function or discipline. By spreading the responsibilities across more people, your document control program is more likely to be current and accurate. When it comes to food safety compliance and best practices, particularly as they relate to GFSI, it’s often the basic principles that get overlooked once your organizations processes and systems are up and running. Setting up a process for document control and maintaining this process over time is a key to achieving and maintaining compliance. As such, it’s important to revisit your controlled document process and library regularly to ensure things are operating as designed and avoid costly compliance surprises at the same time. 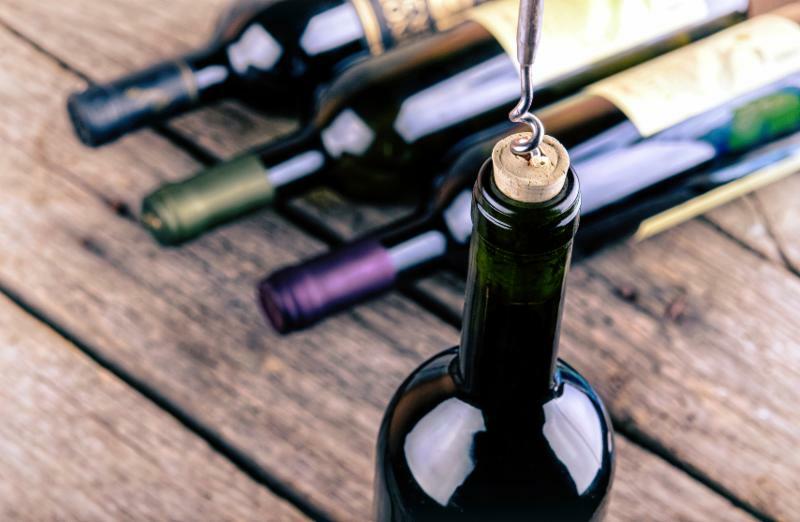 Enjoy these little fun facts about our beloved Napa Valley next time you are wine tasting, at a dinner party or playing Trivial Pursuit. 1) Napa Valley hosts an annual Mustard Festival from January to March, celebrating the "food, wine, art and rich, unique agricultural bounty of the Napa Valley". For some great tips on pairing wine with mustard, check out this article - Courtney gives some great advice. 2) Napa Valley makes up only five percent of the total United States vineyard acreage. The region of Andalucia in Spain has more wine acreage than anywhere in the world. 3) Sulfur is the pesticide most commonly used in Napa Valley and is certified for use in organic farming. Green wine, anyone? 4) Napa's Chateau Montelena caused a sensation when their 1976 Chardonnay put California wines on the map and beat French wines to take top honors at a Paris blind tasting. At the time, Napa was still considered a "backwater" wine producing region that could in no way compete with classic French wine. The plucky story was made in to a lovely little movie called "Bottleshock" starring Bill Pullman, which I got to enjoy on a plane ride back from the UK at Christmas. Pick it up. 5) Stag's Leap 1973 Cabernet Sauvignon further cemented Napa's global image when it won in the red category for that same 1976 Paris blind tasting - and came back to take top honors again in 1986 with their 1972 Clos du Val Cabernet Sauvignon. 6) In the 1830's, George Yount planted the first grapevines in Napa Valley (they were from Mexico), after declaring, "In such a place I should love to clear the land and make my home. In such a place I should love to live and die." He founded the town that was eventually named Yountville in his honor, home to such dining delights as Bistro Jeanty and The French Laundry. 8) The Valley itself is roughly 30 miles long and a few miles wide. If you can actually hit every winery over the course of one weekend, however, then I'd like to shake your hand! 9) The first commercial Napa winery was established by Charles Krug in 1861. John Patchett created the Valley's first commercial vineyard in 1858. 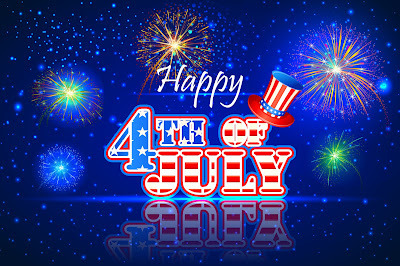 From those of us who love wine, we offer our humble thanks. 10) Of the 140 Napa wineries in existence by 1900, the stalwarts that remain are Beaulieu, Beringer, Charles Krug, Chateau Montelena, Far Niente, Mayacamas, Markham Vineyards, and Schramsberg. You could put together a little tour of "The Classics" next time you are visiting. Markham in particular is one of my favorite wineries in the area. The Safe Quality Food (SQF) Program, recognized globally by retailers and foodservice providers who require a rigorous and credible food safety management system, is proud to announce the formation of a strategic partnership with the Allergen Control Group Inc. (ACG), owners of the Gluten-Free Certification Program (GFCP). As the gluten-free market continues to forecast high-growth, brand owners who are committed to protecting their name require increased food safety and verified evidence before making regulated gluten-free claims. SQFI recognizes that the GFCP is a quality program and recommends the GFCP to suppliers seeking a gluten-free certification. The Gluten-Free Certification Program (GFCP) is a voluntary science-based program designed for manufacturers and brand owners committed to producing safe, reliable gluten-free products for consumers suffering from celiac disease and non-celiac gluten sensitivity. The program requires the implementation of stringent, risk based and preventative gluten-free controls, which easily combines with a globally recognized food safety management system.